The textile manufacturing industry has its own set of material engineering needs and challenges. The operational efficiency is largely determined by the durability of fibers/threads processing components. When these components are subjected to occasional wear and tear, many textile manufacturing corporations make use of fillers to achieve better thread properties, thereby increasing chances of higher wear and corrosion. A&A Coatings strongly recommends specialized thermal spray coatings for providing an extended service lifespan for your textile manufacturing equipment. Our thermal spraying solutions can be customized for the precise needs of the textile manufacturing industry. We offer specialized thermal insulation solutions for washers, drying and dyeing ovens, steam generators, condensate lines, steam lines and etc. Our anti-condensation thermal coatings are spray applied, and are great at providing superior personnel protection in textile manufactories. The low VOC coatings offered by us are highly impactful in retaining energy to the sprayed equipment. This way, the applications work with equal steam amount, thereby saving costs and reducing air pollution. Additionally, the machines are protected against heat-related damages that often affect operational efficiency. 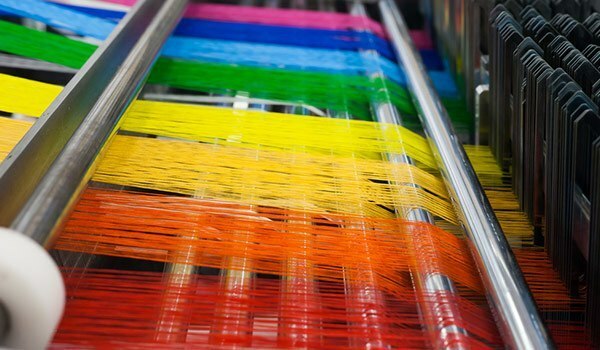 Man-made fibers are usually abrasive in nature (most notably polyester and nylon) and the additives that are commonly used in textile industry (lubricants for example) are corrosive in nature. When combined, these two types of materials will deteriorate surface properties to a great extent. Our thermal spraying solutions are aimed at protecting different textile manufacturing equipment from degrading factors such as wear, corrosion and abrasion. We provide coating solutions for different types of applications such as separator rolls, draw rolls, snick pins, heater plates, weaving shuttles, and etc. A&A Coatings is committed to enhancing textile manufacturing production and offering cutting-edge solutions for textile manufacturers. We also aim to empower textile manufacturers to reduce their carbon footprints by conserving energy and reducing operational costs. To find out more information on the specialized solutions that we offer for the textile manufacturing industry, do send us an inquiry today.